The semifinals of the Argo Group Gold Cup features a past champion, a two-time runner-up, a 12-time entrant and a young gun aiming to upset the balance. Crews led by skippers Taylor Canfield, Adam Minoprio, Björn Hansen and Keith Swinton advanced to the next round of the regatta after surviving a light and patchy day on Hamilton Harbour where the wind rarely topped 5 knots. Tomorrow morning’s semifinal round will pit Canfield’s US One against Minoprio’s BlackMatch Racing and Hansen’s Nautiska Racing versus Swinton’s Black Swan Racing. The winners move on to the final tomorrow afternoon. As the No. 1 seed in the regatta Canfield chose to race Minoprio, which forced the other match up. Canfield, the 2012 champion, and his US One crew defeated Chris Steele’s 36 Below Racing, 3-0, to remain undefeated in the regatta. The crew has won all 10 races they’ve sailed. Swinton’s Black Swan Racing from Australia took down Ian Williams’ GAC Pindar, 3-2. Williams’ crew leads the World Match Racing Tour overall standings and is the world No. 1-ranked match racing crew. But when the match was on the line in a winner-take-all fifth race, it was the younger Swinton, aged 29, who came out on top. Swinton credited his crew’s run through the Repechage Round as preparing them for the challenge. Minoprio, runner-up in 2008 and ’09, and his BlackMatch crew took down fellow New Zealander Phil Robertson and his WAKA Racing team by a score of 3-2. A close match through the first four races, the decider was lopsided in Minoprio’s favor when he got a penalty on Robertson in the pre-start and then Robertson started too early. Hansen is making his 12th appearance at the Argo Group Gold Cup and ninth consecutive with his Nautiska Racing Team. His previous best finish was 2nd in 2007. In today’s light winds he defeated Eric Monnin’s Swiss Match Race Team, 3-1. Monnin’s crew is considered light-air specialists, but they were no match for Hansen. The Argo Group Gold Cup is sponsored by the Argo Group, an international underwriter of specialty insurance and reinsurance products in areas of the property and casualty market. 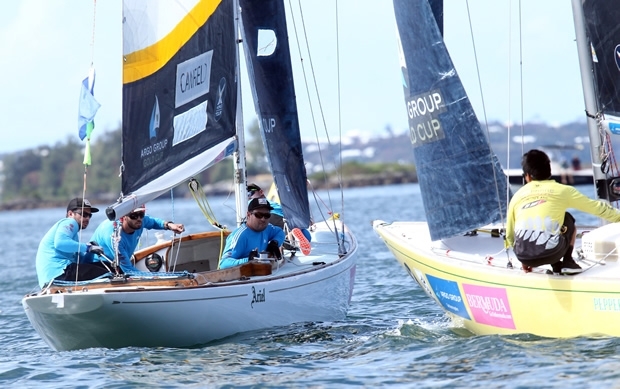 Additional sponsors include the Bermuda Tourism Authority, Bacardi, Guy Carpenter, RenaissanceRe, Aon Benfield, and the World Match Racing Tour and Match Racing Association.